Sports development has become a prominent concern within both the academic study of sport and within the organisation and administration of sport. 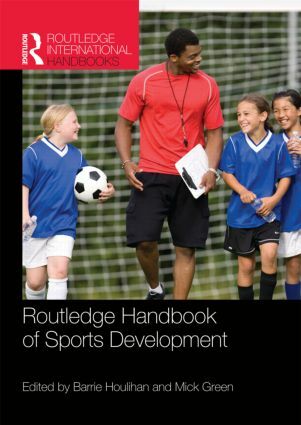 Now available in paperback, the Routledge Handbook of Sports Development is the first book to comprehensively map the wide-ranging territory of sports development as an activity and as a policy field, and to offer a definitive survey of current academic knowledge and professional practice. Spanning the whole spectrum of activity in sports development, from youth sport and mass participation to the development of elite athletes, the book identifies and defines the core functions of sports development, exploring the interface between sports development and cognate fields such as education, coaching, community welfare and policy. The book presents important new studies of sports development around the world, illustrating the breadth of practice within and between countries, and examines the most important issues facing practitioners within sports development today, from child protection to partnership working. With unparalleled depth and breadth of coverage, the Routledge Handbook of Sports Development is the definitive guide to policy, practice and research in sports development. It is essential reading for all students, researchers and professionals with an interest in this important and rapidly evolving discipline. Sport in international development: Facilitating improved standard of living?